Mariano’s Crossing, my award-winning historical novel, recounts the gripping struggle between Mariano Medina, former mountain man and friend of Kit Carson, his Indian wife, Takánsy, and young John Alexander, the son of a hardscrabble sawmill owner, over the future of the Medinas’ fifteen-year old daughter, Lena. Their tug of war soon spirals out of control as secrets past and present propel them toward their final, haunting encounter. The book is based on real people who lived in post-gold rush Colorado. Mariano Medina, an historically significant figure, is best known for his rescue of a U.S. Army brigade trying to cross Colorado in the winter of 1857. Winner of the Rocky Mt. 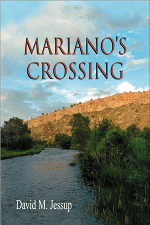 Fiction Writers contest, and finalist for the Colorado Book Award, Mariano’s Crossing can be ordered from regular and online bookstores. Autographed copies of Mariano’s Crossing can be purchased here. Based on real characters and the mysteries connected with historic events, author David Jessup has woven a mesmerizing tale of people struggling to find their places in the rapidly changing landscape of post-gold rush Colorado. Fine writing throughout, with many dynamite scenes and fascinating characters. The descriptions of landscape and the natural world are marvelous, and there’s a lot of great history here, along with a complex psychological dimension and a touching relationship between the characters. Mariano’s Crossing is smoothly paced and taut with drama. The internal conflicts of the characters pull them all forward through the story to its dramatic conclusion. The major characters are well rounded, each with a unique voice, as well as faults and virtues that determine their paths along the way. A great character driven work of historical fiction! Reading this novel set in the Old West, I was reminded at times of two other historical novels, Snow Falling on Cedarsand The Kite Runner. Neither of those books are westerns, but they deal with similar themes—racial and ethnic bigotry and relationships across class boundaries. In all three, there is also a thread of menace. Historical fiction that reads like a true story. Told from multiple points of view, Mariano’s Crossing is a convincing historical treatment. Each character has his own voice and is so believable the reader is convinced each one told his version to Jessup in person. For way too many years, the incredible accomplishments of the Hispanic community have gone untold. Finally, David Jessup illuminates the life of Mariano Medina, a very important Colorado Hispanic pioneer. I very much enjoyed reading his historical novel, Mariano’s Crossing and I know you will as well. 1. With which character do you most empathize, and why? 2. If you could meet any character in this book and ask him or her one question, who would it be an what would you ask? 3. What drives Medina, and what obstacles, external and internal, stand in his way? How do his character traits, both strengths and weaknesses, affect his choices? 4. How does John Alexander change during the course of the book? What motivates him, and how does this motivation affect his choices? 5. What priorities direct Takansy toward the choices she makes? How does her past influence her choices? 6. Medina, Takansy and John Alexander have different points of view when it comes to understanding Lena’s needs. Whose view did you find most compelling? Least compelling? 7. Have you ever experienced a dilemma similar to Lena’s, of wanting to please different people you care about? How were your choices different than hers? 8. The poem at the front of the book mentions “Joy’s trick.” What is Joy’s trick, and how does it apply to each of the characters? 9. What role do landscape and setting play in the story? What did you learn about the period and setting that you didn’t know before? 10. Were you caught up in the story’s time and place? 11. What is your favorite scene in the book, and why? What major emotion does the story evoke in you as a reader? 12. At what points in the book were you most curious to find out what happens next? 13. What do you think the book is about? What are some of the book’s strongest themes?